Apple partner supplier Sony on Monday announced an upcoming 21-megapixel CMOS sensor with onboard plane phase detection autofocus signal processing, 4K video output and still image HDR, all features that could trickle down to a future iPhone model. According to Sony, the Exmor RS series IMX230 is the first stacked-type sensor to offer local phase detection AF, a technology that allows for rapid focusing on fast-moving subjects. Apple branded the tech "Focus Pixels" when it introduced the iPhone 6 and 6 Plus models, which themselves sport early-generation Exmor RS sensors. By stacking circuitry below the sensor's backside illuminated pixel array, Sony was able to squeeze in advanced phase detection signal processing hardware to parse data from 192 available AF reference points (Focus Pixels). The Sony sensor used in the iPhone 6 and 6 Plus is thought to offload phase detection processing to the A8 system-on-chip. With onboard capabilities, however, autofocus on the next-gen part should be much faster. As noted by Chipworks, the iPhone 6's iSight module sports these so-called Focus Pixels laid out in the green channel across a large portion of the pixel array. In testing, AppleInsider found phase detection to be incredibly fast, almost to the point of being instantaneous. At 5,344 pixels-by-4,016 pixels, the IMX230 has 21 effective megapixels, allowing the sensor to push out 4K video. 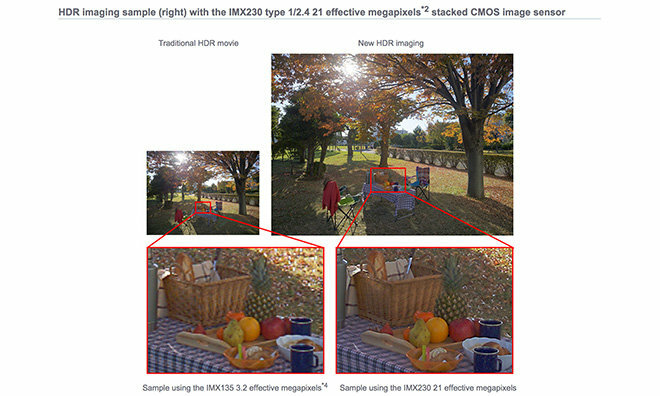 In conjunction with improved pixel placement, the image processor supports HDR video recording and adds the same capability for still image photography. In addition to the IMX230, Sony revealed it is working on an as-yet-unnamed 16MP sensor with phase detection and HDR imaging. Apple will likely build on Sony's new designs for next year's iPhone refresh, though is unknown whether that model will be the IMX230, the 16MP variant or another Sony part using pixels 1.5 microns in size. The Cupertino tech giant traditionally opts for older generation hardware, like the current Exmor RS-based module that appears to be an iteration on 2012's IMX014 design, and extracts high-quality images through in-house image processing on board the A-series SoC. Sony's IMX230 is slated to head out to smartphone manufacturers in April 2015, while the 16MP version is set to debut later next year.